I admit, I do love a salad, but we throw it in tacos, on burgers and sandwiches, in spring rolls, and in smoothies and green juice. The smoothies and juices had us plowing through greens like whoa. 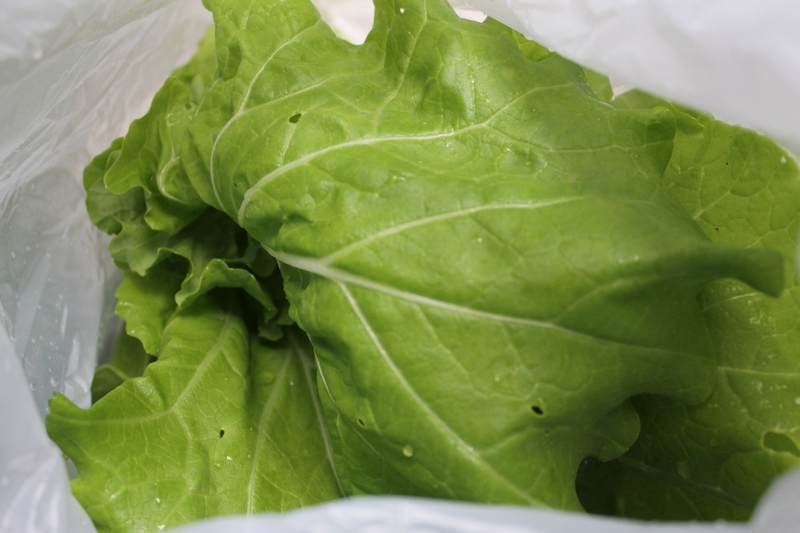 We’re spoiled with our year-round CSA in SoCal, but I’m excited for the start of spring mix after all those hardy winter greens. I eat salad almost every day for lunch and my absolute favorite dressing is: 1 part Dijon mustard, 1 part honey (I use a local-to-me honey), 1 part apple cider vinegar (I use Bragg’s raw, unfiltered), 2 parts extra virgin olive oil. Shake it up and it’s delicious! I actually crave this dressing, which is so weird. But it’s so good! Enjoy your CSA! We had one a couple of years ago but it was just too much food. I felt bad for throwing stuff on the compost heap when we couldn’t eat it in time. Now we shop at our local farmer’s market every week instead and buy just enough. And as a happy coincidence, the farm that did our CSA sells at our market! So I still buy from them. Win-win! Well, you just did taco salad, but lettuce tacos are also delicious. Just use the lettuce in place of a shell. Works even better if you make the “innards” a little spicier than usual. 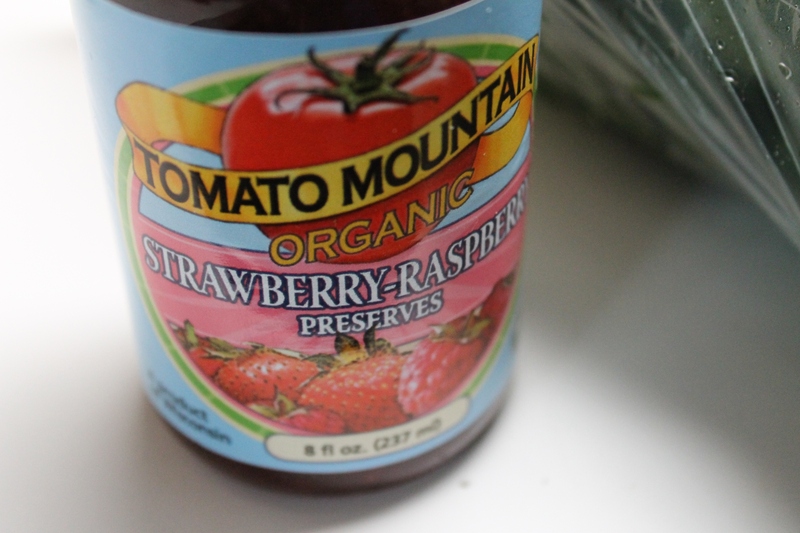 Tomato Mountain also makes the best salsa I’ve ever tasted…check it out! …I mix the above ingredients with two forks held together in a “spooned” position. I don’t know why, but this way of mixing helps me create a thick emulsion. Once this is thick, I add 2 tbs olive oil and mix again with the two forks until thick. Repeat with the olive oil 3 more times, mixing after each addition of 2 tbs. The dressing is thick and you’ll probably have enough for two salads. I usually just lurk, but I wanted to say I saw your post last time about possibly going with Tomato Mountain, and that led me to choose them for a CSA too! So definite thanks for that. The delivery is just too convenient and the ability to choose different sizes is really helpful. I agree on the greens – I would never choose to buy so much for a week but I think that just means we need to be eating more! 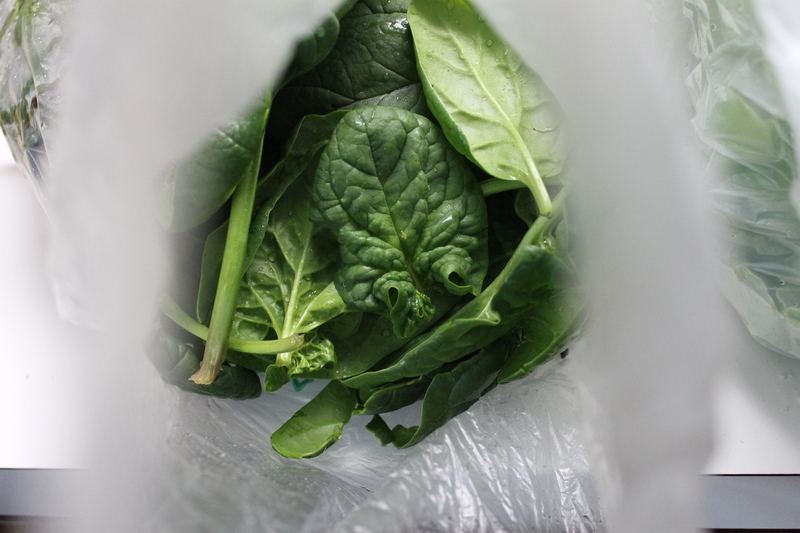 And agree on the Red Rain dark greens – I keep munching on the raw undressed greens while putting together a salad. I used the other greens in a stir fry and a soba noodle dish. Oh, and with the spinach I made a pesto for pasta, but could have happily eaten it with a spoon. 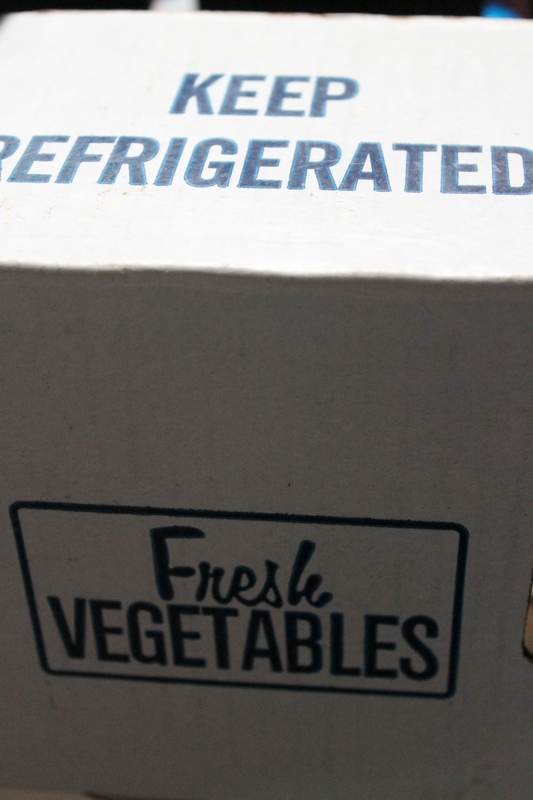 I’m now brainstorming how to use this week’s delivery! A friend of mine makes dressing she calls “2-2-1” The name is the recipe. 2 parts olive oil, 2 parts balsamic vinegar (or another of your choice, balsamic is really good), 1 part dijon mustard. I giggled over this post- the lettuce tsunami didn’t have any lettuce! 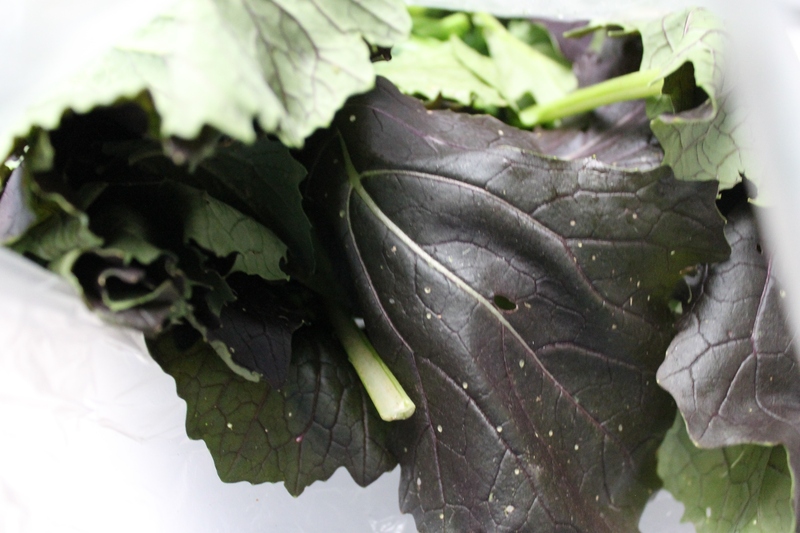 The red rain is a mustard green, and Tokyo bekana and vitamin green are related to pak choi and tatsoi. All of these can be cooked as well as eaten raw. 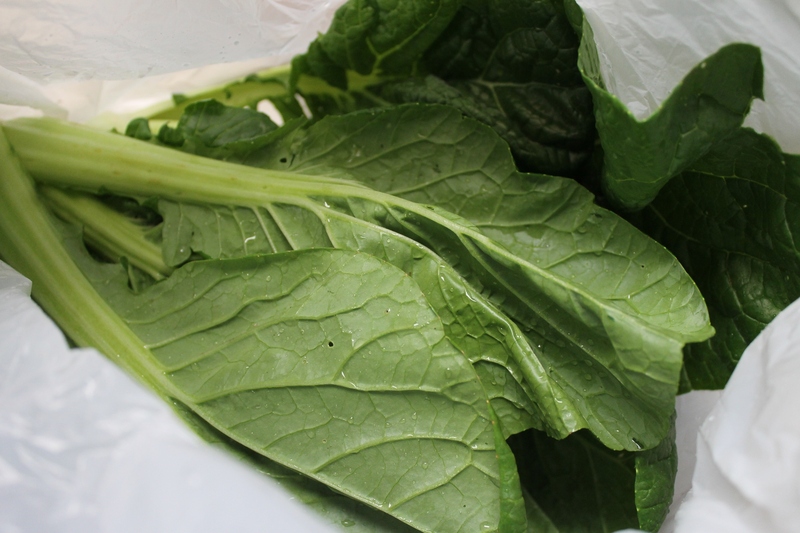 My CSA box has had lots of greens lately, too- turnip greens, arugula, pak choi, lettuce, radishes (in past seasons I’ve just composted the radish tops, but my cookbook says they can be treated like turnip greens, so I’ll be trying that for the first time this week). It’s pretty cool that you’re willing to try something new, even when it’s so unfamiliar! One of my favorite dressings is easy and delicious. 3 TBS olive oil, 3 TBS apple cider vinegar, 1 TBS of honey, salt and pepper. Sometimes I throw in a smashed garlic clove as well.